People ask me always what I want to be remembered by, and I would like it to be not for my mistakes, but for the things that I was able to achieve – those that have touched the hearts of the people in my own country and beyond. God has been kind to me, and I have been very lucky indeed to have gained recognition and appreciation almost all over the world. It has been my good fortune that there have never been any problems with communicating the greatness of our music. In places where the people had never even heard of it, nevertheless it has been an instant success, and still there are warm receptions today everywhere I go. Ravi became the bridge between my Western and Eastern sides. In many ways I’ve felt just like a patch board: I like to plug one person into another, one type of idea into something else. Ravi was special to me, because without him I wouldn’t have been able to get into the Indian experiences so easily. By having him as a friend, I could experience the best of India, and I was able to find it straight away. I said in an interview recently that without Ravi I would have ended up a boring old fart. Some people may still say I’m a boring old fart, but at least my life was enhanced and given much more depth through the ancient Indian culture, and Ravi was my contact with it. A great musician indeed, and an inspiration for me. I was fascinated by his playing and the forms of it from my first hearing, but I always returned to it when I was gearing up to write programme notes or another essay on Flamenco. The nexus of the two is most clear in those Flamenco forms that use the enharmonic scale and touch upon microtonality (which brings to mind Cage's Microtonal Ragas). 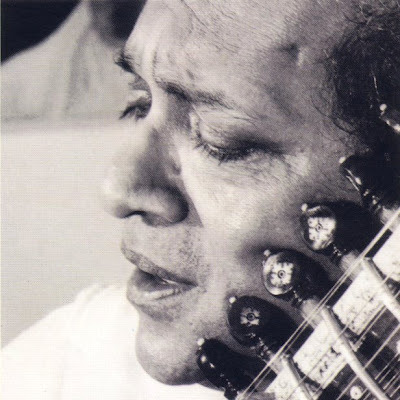 I should, I must say, the sooner have heard Ravi perform with a Flamenco cantor and guitarist than with Yehudi Menuhin. I really can't doubt that that would have been vastly more revealing. But never mind -- he left us a cornucopia of recordings, opened many Western ears, and he will be greatly missed globally, this last a great part of his achievements.